138.6 mm/55 (5.46") Model 1910 guns in casemate mountings on Provence in 1932. Note missing bow casemate guns and the plated in mountings on the stern. Used for anti-torpedo boat batteries for capital ships. 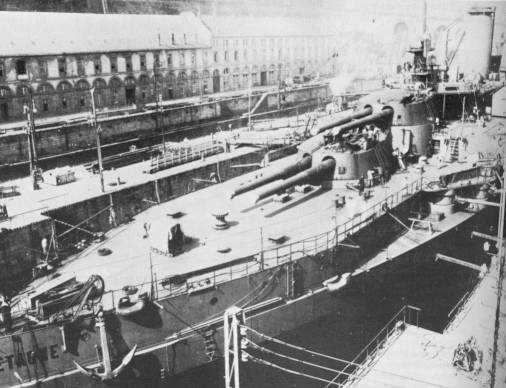 The stern guns on the Courbet and Bretagne classes were mounted too low, only 12 feet (3.6 m) above the waterline and were liable to be washed out in even light seas. The Bretagne class had these guns removed and the ports plated over. Some of these guns were then used on sloops and in coastal defense batteries. Guns were of built-up construction with a screw breech and used separate ammunition. ^1.11.2"French Battleships of World War One" says that the Elevation rate was 3.1 degrees per second and the Train Rate was 5 degrees per second, but this would have depended on having fresh, experienced crewmen. The Courbet, Bretagne and Normandie classes had projectile and propellant hoists for each section consisting of two or three guns. These hoists could deliver 15 complete rounds per minute with electrical power or 3 complete rounds per minute when manually operated. Each section also had a ready storage of 9 complete rounds per gun. In service it was found that the forward four guns on the Bretagne class were washed out in anything but calm conditions and in 1918 they were removed and the casemates plated over. Refits during the 1930s removed the two after guns on each side, reducing the total to 14 guns. Battleship Bretagne about 1918. At this time she still retained her forward 138.6 mm guns. 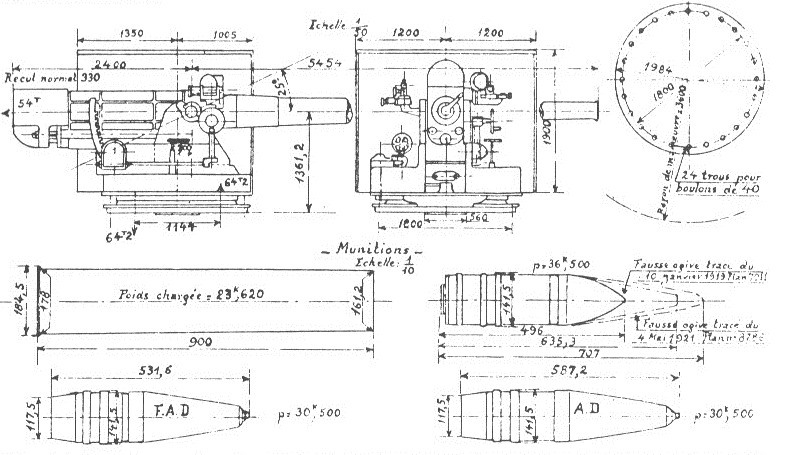 Official 138.6 mm Model 1910 Mounting and Ammunition Sketch from the collection of Robert Dumas.